If you've ever needed to draw a perfect circle freehand, you've probably figured out that it's pretty tough to do. How will you make some of the other cool things powered by rubber bands that we've talked about on the blog if you can't put together an ace blueprint with perfect dimensions? At least when it comes to drawing that circle, we've got you covered. It just takes three pencils and three rubber bands, as Youtuber ChalkStreet shows us in their video about creating a quick DIY rubber band compass. Start off by taking two of the pencils and holding them inverted to each other, with sharpened ends facing away from each other. Secure them together with a rubber band wound around one end. The video doesn't explicitly show this, but it seems like a really clever touch to use the rubber eraser-end of one pencil to anchor the compass while drawing with the other. 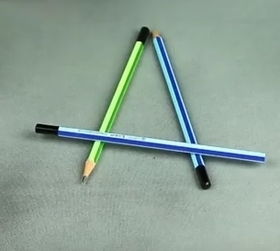 Split the pencils apart in a V shape and lay the third pencil across them near the bottom to make that shape a triangle. Use individual rubber bands to connect that third pencil separately to each of the other legs. Once all three rubber bands are in place, the compass is complete. Place that eraser end down on a piece of paper and tilt the pencil around to make a perfect circle. Even as a simple tool, the compass can be adjusted just by sliding the rubber bands along the crossbar pencil to widen or narrow the gap between the anchor and the point. Now use that compass to put together some beautiful blueprints.